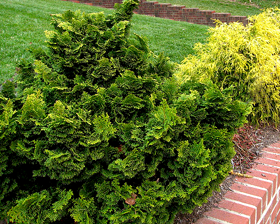 Dainty, dwarf Cypress (Chamaecyparis) with scalloped, dark green with bright white splashes twisted foliage, forming textured waves. Young plants exhibit a low rounded habit and mature into an upright, conical shape with irregular spreading. A beautiful dwarf specimen that should never be sheared-and does not need to be! Grows to approx 1-2m. Seeds need to be stratified in dampened peat or sand, in a plastic box or bag at 4°C or 5°C in a refrigerator about 2-3 months before sowing. The seeds should not be frozen or in a wet medium. After that move them at 13-15C. Seeds will usually germinate in 30-60 days.